Here's a page featuring my gorgeous and sorely missed furry friend Archie. 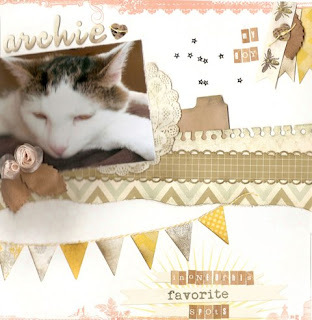 This is the FIFTH page I've made from my Quirky Kits and I still have loads left. 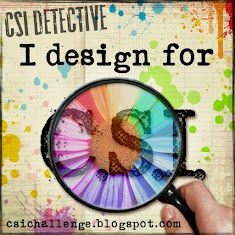 The layout was inspired by a sketch from Cathy Schellenberg for Scrapbook Magazine. The Amy Tangerine Alphabet which came with the main kit has been so versatile - it's a pale grey pattern in its raw state, but takes inks really well and this time I've used Walnut Stain Distress Ink to colour the bottom of the letters so they stand out against the background and echo Archie's fur coat. I've also used some of the gorgeous suede effect leaves and the roses are made out of one of the glassine envelopes which came in the kit, which I first tinted with Tattered Rose Distress Ink. Here's a YouTube tutorial showing you how easy it is to make spiral roses - I put them all over the place now and especially like them made out of old book pages...it's SO easy honestly! The only thing I had to add to this page from my stash was some yellow twine, everything else came from the Quirky Kit.